He is finally here. If you’re in Joburg this October, please join us for the premiere of my new production. In the end, we must all move on. Well. Sort of. 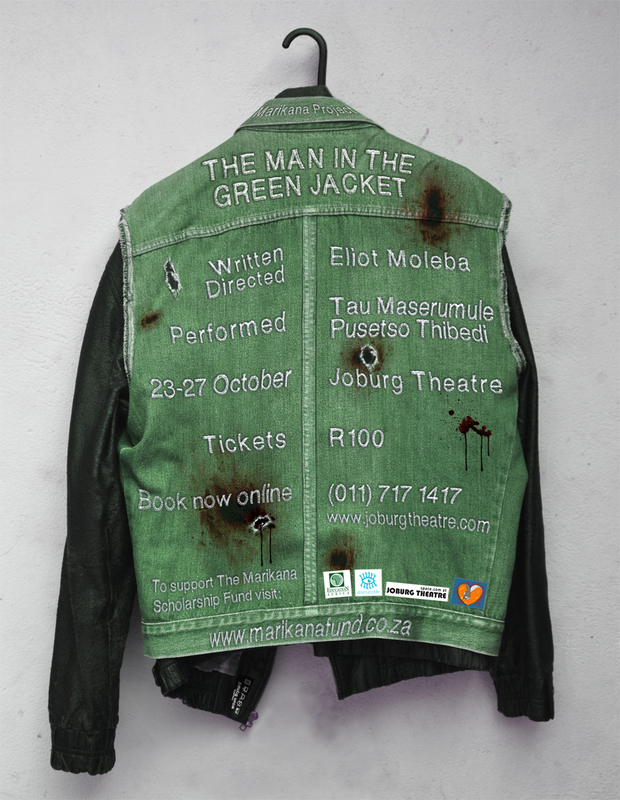 Eliot Moleba premiers his new play, The Man In The Green Jacket, taking place at the Joburg Theatre (Space.com), from the 23rd – 27th October, 2013, and the production will feature an exceptional cast of Pusetso Thibedi and Tau Maserumule. Written, in part, as a response to the Marikana massacre, the play asks whether there can be growth through tragedy. It also poses questions of our responsibility, as a society, in the aftermath of Marikana, especially the continuing challenges that face the affected families and children. The play is promoting awareness nationally about the impact of the Marikana massacre on the families left behind. In partnership with Education Africa, we’ve also founded The Marikana Scholarship Fund to collect donations that will go to the educational needs of the affected children. This scholarship fund is founded on the belief that unless something is done to secure these children’s future, the perpetual cycle of illiteracy and unemployment will continue to rise. So we’re 7 weeks away from the opening week of my new play, The Man In Green The Jacket, which will run from the 23rd until 27th of October at the Joburg Theatre. Please follow my updates to keep up with news. I’m also excited to confirm that on the 25th of October, the opening night of the play, will also mark the launch of The Marikana Scholarship Fund campaign. In partnership with Education Africa, we will launch the campaign to collect donations that will go towards the education of the children who lost their breadwinners during the marikana massacre last year. So please stay tune and support the project. For any queries, you know how to get in touch with me. It is been a while since I have updated my website. I have just recently returned from a European trip and will now be posting frequently again. I thought I would have time to make some posts while I was away but there was so much to go and see and experience that I just never got around it. After 3 months of exploring new places and faces, I’m now settling into the familiar faces at home of friends and families; people I have missed dearly while I was away. It is great to be home, and might I add, I don’t think there is any other city for me like Joburg! The pace of life here is much more dynamic and surprisingly more interactively than anywhere else I have been. It is good to finally be home. I will post more about my crazy adventures in Europe soon. For now, I hope you all well. See http://www.artascent.com for submission details and to enter.